In 1986, audiences were introduced to a new member of the Autobots – a happy-go-lucky, “all-American” Autobot, Hot Rod. When Optimus Prime passed early in Transformers the Movie, he predicted that an Autobot would rise from the ranks, and light their darkest hour – a prophecy fulfilled in the conclusion of the movie where Hot Rod seized the Matrix of Leadership from Galvatron and became Rodimus Prime! We’ve had a good few years for Hot Rod toys, with a new Masterpiece Hot Rod and Titans Return Hot Rod filling the roles of cartoon homaging high-end release and reimagined Generations figure respectively, and before both we had other updates to Hot Rod. But Rodimus Prime has until now had a much more limited outing, with only a Titanium figure that is really showing its age and a Masterpiece figure that is infamous for its quality control issues. 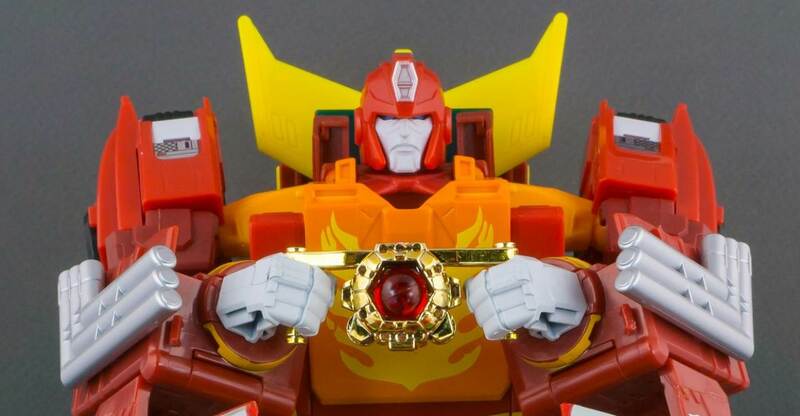 We’ve never had a Classics or Generations style Rodimus Prime – until now! Power of the Primes gives us a welcome Generations update of Rodimus Prime, with the added bonus of including a smaller Hot Rod figure who can “arise” into Rodimus Prime by combining with his space winnebago trailer. 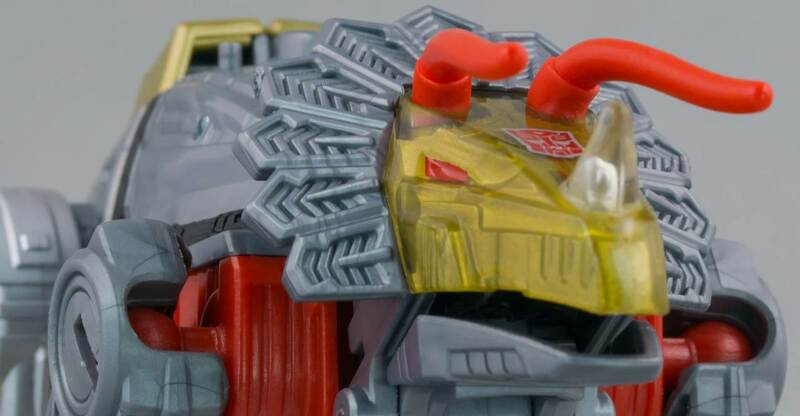 We’ve added a new photoshoot to our Transformers toy galleries, and we’re showing off another of the Dinobots from Power of the Primes: Swoop! Updated for a new generation, Swoop is a personal favorite of mine among the first releases in Power of the Primes Deluxe Wave 1. The dinosaur mode is boxy, but that is completely accurate to the look of the original design in Generation 1, and the design is chock full of molded in details. The robot mode is slender, which fits Swoop perfectly, and the figure takes a refreshingly different approach to the combiner feature compared to every other modern combiner figure. What really drew me to Swoop though was how utterly amazing he looks when mounted on a display stand in either mode – the combination of those wings, the molded in detail, and a decent amount of poseability, means Swoop just looks great on display. 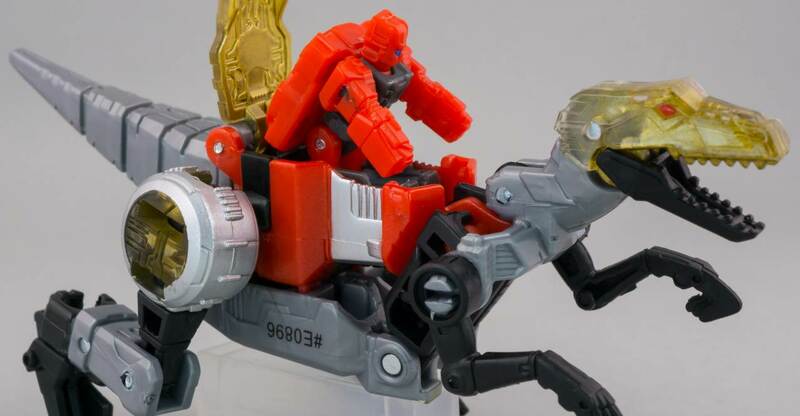 Check out our gallery to see why we’re hyped for this Dinobot bombardier! We’re back at last with another new gallery update. We’ve still got a few more Dinobots left to showcase, and we’re kicking off with a look at the Power of the Primes version of Slag Slug! The Dinobot triceratops flamethrower is an interesting one. 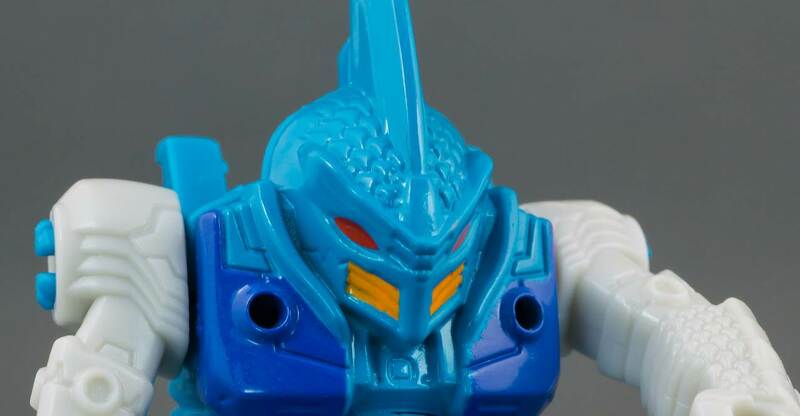 On the one hand, he is a fantastically detailed release, who nicely updates the transformation of the original Dinobot to recreate both modes of the original character, including the “robot head in the mouth of the dino head” that really defined Slag back in Generation 1. As Hasbro advertised, the combining peg is also (mostly) hidden, so you can ignore that facet of the design if you choose. On the other hand, Slug feels undersized. His robot mode really feels like it lacks a little bulk that you’d associate with the Dinobots, and while the triceratops mode looks good, it feels a bit small. Overall, not my favourite release in the Power of the Primes line to date, but it is the first genuine 100% update to the 1984 Slag since the Classics line started and it does look good when used as a set with the other Power of the Primes Dinobots. Check out the gallery for over 100 pics of this Dinobot flamethrower whose name we can’t keep straight. We’ve got another new Power of the Primes gallery for you to enjoy, and we’re carrying on with the Dinobot love with their mighty commander – Grimlock! The big guy has a much more Generation 1 inspired look this time out, with a transformation to match. As he’s also the core of the Volcanicus combiner, Grimlock’s got a few sacrifices in his design – such as his wide dino hips and his T-Rex mode’s back being mostly dinosaur bits. 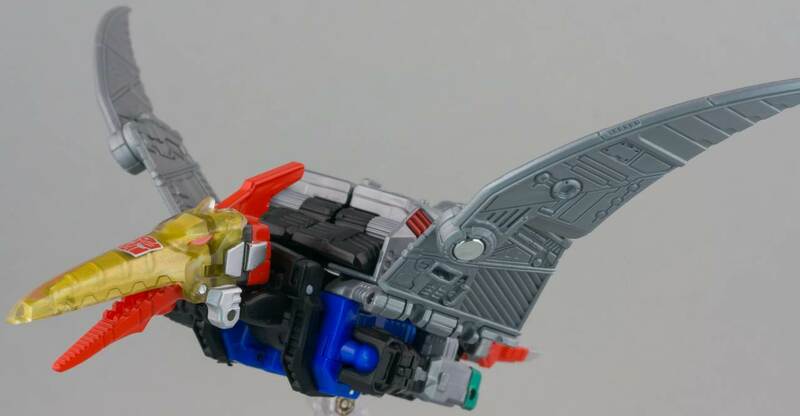 We’re not terribly fond of his exposed combiner ports, either, especially since some previous offerings in Combiner Wars managed to conceal them. However, Grimlock shines in his robot mode, which has an excellent and buff silhouette. Grimlock is not without his flaws – however, he is a fun toy and a good realisation of the Generation 1 design in a modern toyline. It’s also a pity that Hasbro couldn’t give Grimlock a sword, since while the Volcanicus feet make for good gauntlets and can flip round to add some other weapon options via their 5mm sockets on the rear, they aren’t the same as Grimlock’s trademark weapon. Overall, he’s by no means a bad toy, though he’s equally not up to some of the standards Hasbro themselves have set with the likes of Nitro or Hun-Gurrr in recent times. 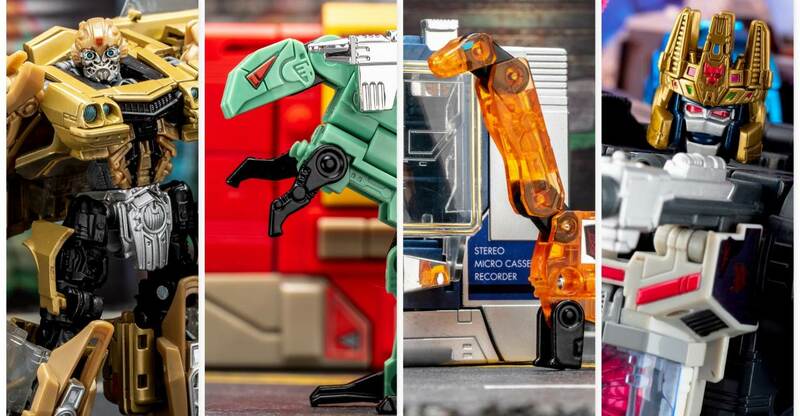 We’re back with another photoshoot for Power of the Primes – and we’re unleashing the Dinobots with the newest member of the crew, Slash! A female Dinobot who transforms into a raptor, Slash’s bio suggests she is a tracker – which means she is well suited as a Legend class figure which is usually where the scout and espionage type characters like Bumblebee feature. Slash’s design also features some cool tricks, including a transformation that seems to be inspired by Beast Wars Dinobot. The overall design manages to successfully evoke all the features that made the look of the original Dinobots, really helping to make Slash appear a part of the team. Overall, Slash is a nice figure. Both modes are nicely poseable, though the raptor mode has some balance issues. Slash is also a figure who really needs a weapon – we recommend the axe from the 2013 Generations Orion Pax, as Slash looks pretty awesome with an axe or polearm. Check out her gallery below – we’ve got some shots of Slash with a couple of different weapons for your viewing pleasure, as well as lots of pics of the robot mode and beast mode in many poses. Enjoy! 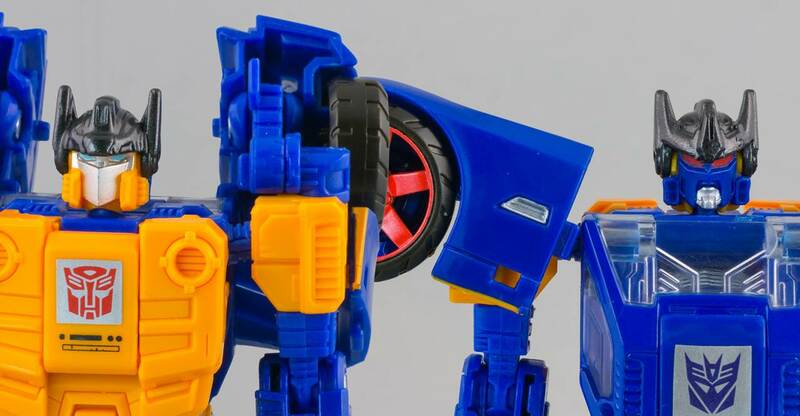 We’ve got another Power of the Primes gallery to share with you, and we’re moving on to the Legends class with Beachcomber. The pacifistic Minibot is finally given his due with a new toy in scale with the rest of the Legends class Minibots, and is a great rendition of another of the original Minibots. Hasbro really got this one on-point with a faithful design and a good level of articulation, as well as a clever transformation. Beachcomber is one of the good ones, in a size class that has been established as one of the most enjoyable ones out there. Check it out and see for yourself. No April Fools for you today, just a sharp new gallery! We’re rounding out our look at the first two waves of Prime Masters with a photoshoot of Power of the Primes Landmine with Alpha Trion. Landmine as standard for the Prime Masters looks very sharp, with the inner robot face filling the space of the helmet like his fellow Autobot Prime Masters Metalhawk and Cloudburst. He’s a Metalhawk remold, but carried out well enough to not be immediately obvious. The inner robot, Alpha Trion, looks nothing like the Autobot scholar, but looks like the inner robot of Landmine, so we’ve got to give him points there. Overall, Landmine pulls off the look of the original Autobot pretender armor well and is a sharp looking toy, though he’s no match for the Decepticons in the same line. Check out his gallery and enjoy. 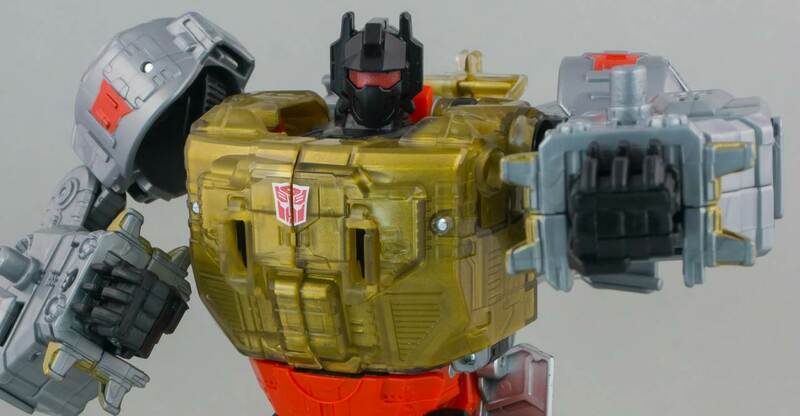 Next up is our gallery of Power of the Primes Submarauder, who conceals the Prime, Alchemist Prime! Submarauder was the only one of the Decepticon Pretenders I owned back in 1988, so the Decepticon Creature from the Black Lagoon has a place in this fan’s heart. Power of the Primes does a fantastic job of faithfully recreating the original character, who has the added bonus of turning into a trident. The design is nice and intricate, capturing everything that made the original shell look awesome. Alchemist Prime, though, is underpainted and feels generic in design, but then, that just means we know who the star of the show here is. Submarauder is a great addition to the Prime Masters line of figures, and a good accompaniment to the other Prime Masters, especially Skullgrin and the upcoming Bomb Burst. If Prime Masters are your thing, then you’ll love him. If not, consider giving him a try – he’s one of the best looking yet. Check out his gallery to decide for yourself.